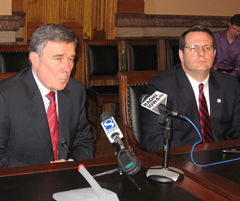 The U.S. Drug Czar is staying out of the medical marijuana debate in Iowa. Gil Kerlikowske says it shouldn’t be up to him or even voters to determine the effectiveness of prescription pot. “Whether a medicine is effective or not should be answered by medical scientists and not a vote…I think I’d leave it at that,” Kerlikowske said Monday at the Iowa Statehouse. The director of the White House Office of National Drug Policy was in Des Moines Monday to gather input for a new national drug control strategy. The Iowa Board of Pharmacy will hold its fourth and final public hearing regarding the pros and cons of medical marijuana Wednesday in Council Bluffs. The board will then issue a recommendation to Iowa legislators. Kerlikowske says any state considering the legalization of marijuana for medical purposes should look closely at the challenges police in California have faced in enforcing the law. “There’s a paper, done by the California police chiefs, that talks about the robberies and assaults occurring in and around some of the dispensaries…particularly in Los Angeles. Other parts of California have handled it better,” Kerlikowske said. Kerlikowske issued a statement last month declaring the legalization of marijuana, for any purpose, as a “nonstarter” in the Obama administration. To date, 13 states have enacted laws that legalized medical marijuana.